We're starting a new feature on our blog - every week, we'll post a picture or illustration here reminding you of the consequences of passing Initiative 912. 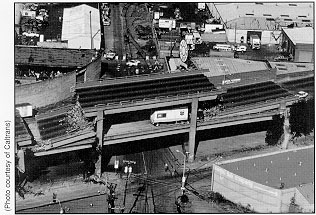 Remember: If we roll back funds to replace critical structures like the Alaskan Way Viaduct, then we put ourselves at risk for a disaster in which there will be death and massive destruction. This is the future of the Alaskan Way Viaduct if we don't act. An earthquake could strike at any time. It happened in California; it could happen here. And it will happen here unless we take that viaduct down. The longer we wait, the greater our risk. Want the viaduct to collapse in the next disaster? Then VOTE YES ON INITIATIVE 912!